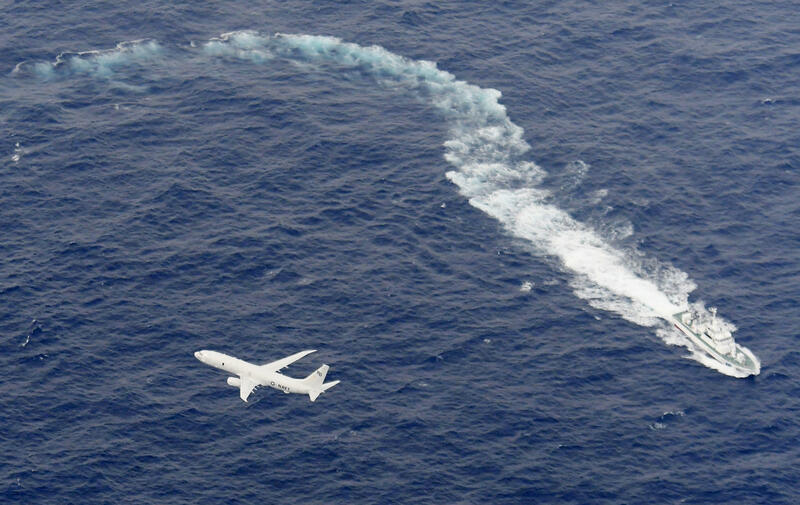 TOKYO -- A U.S. Marine Corps refueling plane and a fighter jet, carrying a total of seven U.S. Marines, collided and crashed into the Pacific Ocean off Japan's southwestern coast early Thursday. Rescuers found two of the crew members involved, officials said, but one died later after being pulled from the water. A search and rescue operation was continuing for the five others. The U.S. Marine Corps said the 2 a.m. crash involved an F/A-18 fighter jet and a KC-130 refueling aircraft during regular refueling training after they took off from their base in Iwakuni, near Hiroshima in western Japan. The U.S. military said the crash occurred 200 miles off the coast. Japanese officials said it happened closer to land, about 60 miles out, and that's where the Japanese search and rescue mission found two crew members. There were two pilots in the F/A-18 and five crew members in the KC-130, officials said. One of the troops rescued from the Pacific was in fair condition and the other was transported to a local hospital for evaluation. The U.S. military later confirmed that one of the Marines had died. The Maritime Self-Defense Force, which dispatched aircraft and vessels to join in the search, said it first recovered one of the fighter jet's crew members in stable condition. The crash was the latest in recent series of accidents involving the U.S. military deployed to and near Japan. The Reuters news agency noted that U.S. military accidents are a "sensitive" topic in Japan, especially in Okinawa, where most of the U.S. military personnel in Japan are based. "A series of emergency landings and parts falling from U.S. military aircraft have highlighted safety concerns," Reuters said. "My heart goes out to the families and the colleagues of the Marines that were involved in this tragedy," U.S. Ambassador to Japan William Hagerty told journalists on Thursday. "They risk their lives every day to protect Japan and to protect this region, and sometimes they pay the greatest cost. So I want to emphasize this security alliance that we have is critical and it is moving forward in a very positive direction."